Today’s guest post is by Liam Barrett. Travelers often like to save their dollar where they can on food during their travels, whether it’s sticking to a daily spend limit or buying snacks on the go. Sure, budgeting on food is a great way to save up extra money to spend on a unique local experience or a shopping splurge. But if the next stop in your itinerary is Sydney, you simply can’t skip taste-testing some of the delicious flavours we’ve learned to master over the years. As a young city built by migrants from many walks of life, our legacy of welcoming different cultures has created a truly diverse palate that encompasses all the different cultures our country is comprised of. For any visitor who writes off Sydney as just beaches and no history, try the different flavours local to the different corners of our colourful city. Unbeknownst to many, Sydney actually offers some of the world’s most developed flavours in Asian fusion, a recipe we’ve brewed in a melting pot of Asian cultures infused with the contemporary. In more recent years, we’ve erected numerous food courts to the style of Southeast Asian hawker lanes with modern twists. A popular haunt is Spice Alley, nestled in the Kensington Street precinct of Chippendale. Here, you’ll find a series Asian food stalls sprawled in a painted laneway. While you’re in the neighbourhood, you can also check out White Rabbit Gallery, which houses the world’s most significant collection of contemporary Chinese art, as well as a tea house that serves a delectable range of tea flavours for anyone who enjoys an afternoon tea. 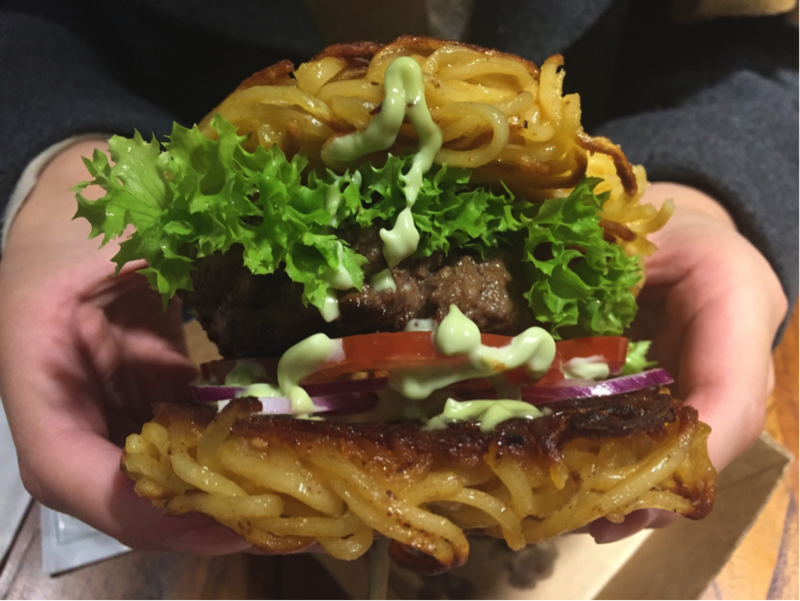 Closer to the city, there’s also ONE Tea Lounge, a modern Japanese restaurant that makes ramen burgers and ice cream “baogers” – both have attracted huge online followings and make a great photo op. Here in Sydney, coffee and brunch come hand in hand as the two pillars of basic human rights all locals hold sacred to our Sunday mornings. You’ll find that baristas everywhere make delicious coffee, a staple in every unassuming cafe you venture past in the city. A personal favourite is Delisse, nestled right in the centre of Sydney’s CBD – you’ll be blown away by their mouth-watering display of pastries every morning! Photo by Amy Cai, Instagram. If you have the time for brunch, I recommend the Grounds of Alexandria, a kitchen garden with farm animals you can play with that live on the residence. The Grounds has been recorded as one of the most Instagrammed places in Australia and by far Sydney’s most famous brunch venue. Photo by The Grounds, Instagram. As a city that reclines along one of the world’s most beautiful harbour lines, it’s no surprise that Sydney offers countless seafood restaurants with magnificent water views. If you’re into seafood, you’re in luck. The walk around the docks of Darling Harbour is accompanied by a chain of restaurants that all compete to serve the freshest catch of the day you can get. Among the best money can buy you is Nick’s Seafood Restaurant, which makes mouth-watering fresh seafood platters for groups interested in trying everything. For something more low-key, I recommend Doyle’s, Australia’s first seafood restaurant, which stands on the shores of Watsons Bay as a popular food joint for visitors and one of the fanciest fish n chip shops in Sydney. Watsons Bay is also a great location for a quick day trip – a public ferry from the city will take you across the harbour, giving close-up views of the Opera House and Harbour Bridge, before docking right on the bay’s sandy shores in just under 20 minutes. Once there, a short trek past the shore area will reveal uninterrupted views of our city across the waters. No great meal is finished without a dessert, and if you have a serious sweet tooth, you’re in luck. In the past year alone, our creative ice cream scene as absolutely taken off, with new concepts being made popular every month. You’ll find that some of the world’s best gelato makers actually dwell down-under – nestled in the hip suburb of Newtown is Cow and the Moon, which actually won World’s Best Gelato a few years ago for their Mandorla Affogato flavour. For one of our most creative ice creams, N2 Extreme Gelato is an easy favourite among the food stalls in Chinatown. On any given weeknight after dinner, the lines of people waiting for a cup of beautifully arranged ice cream frozen with liquid nitrogen right before your eyes easily extends past hour-long wait. Sydney might be one of the most expensive cities in the world, but if there is one thing worth splurging for, it’s the chance to try out some of our diverse cuisines. Whether it’s a waterfront restaurant or a hidden Asian Hawker lane, it’s simply impossible to overlook our city’s love for food, and sooner or later, you’ll fall in love, too.